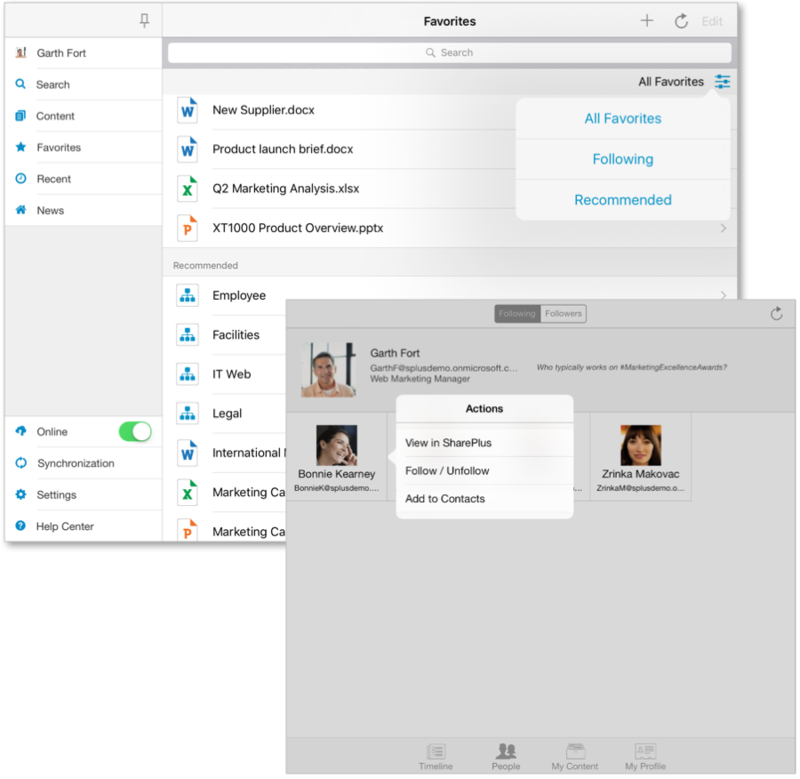 Social collaboration has been reorganized and greatly enhanced through SharePlus new Social Module, providing a centralized and feature-rich User Experience (UX) for SharePoint 2013 social features. 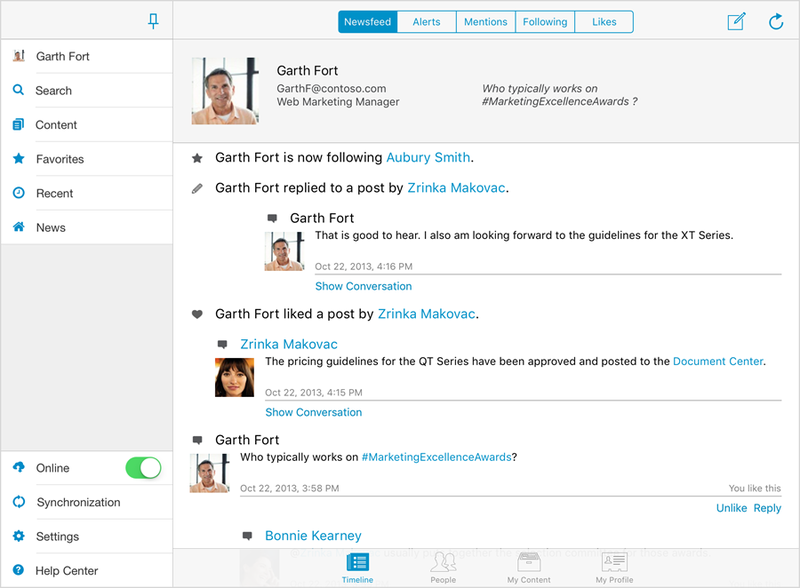 The Social Module lets you share your ideas, as well as discover and keep track of your colleagues and their work. You can connect with people, start conversations, and also access their content and activity feed. Your SharePoint personal storage (My Content) is available in this module, including both your public and private document libraries. The Module is divided in four sections: Timeline, People, My Content and My Profile. Newsfeed – Includes public posts and other people’s activities. 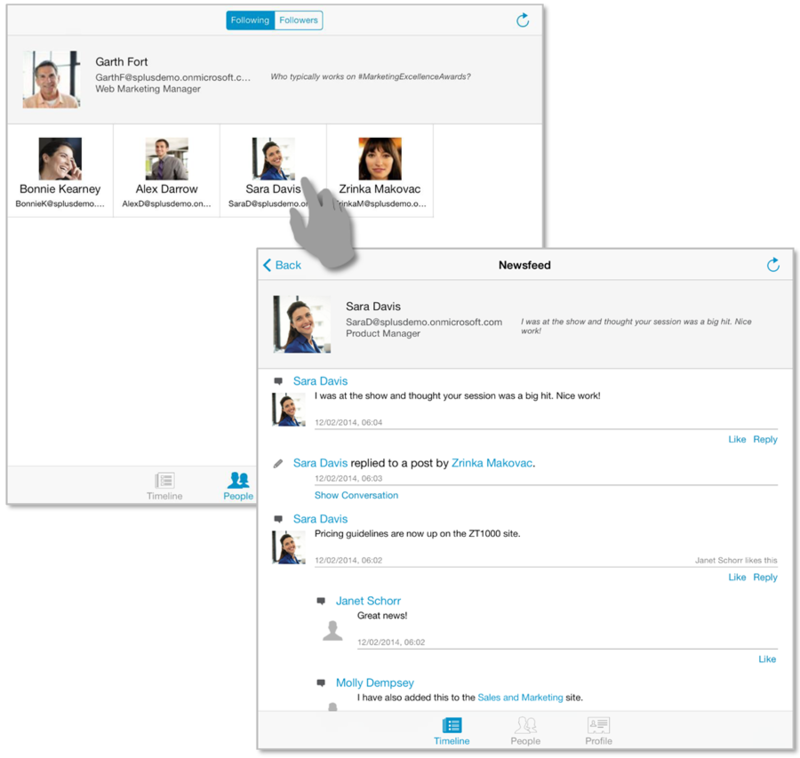 Besides creating new posts, or mark items you like, you can also start conversations with colleagues here. 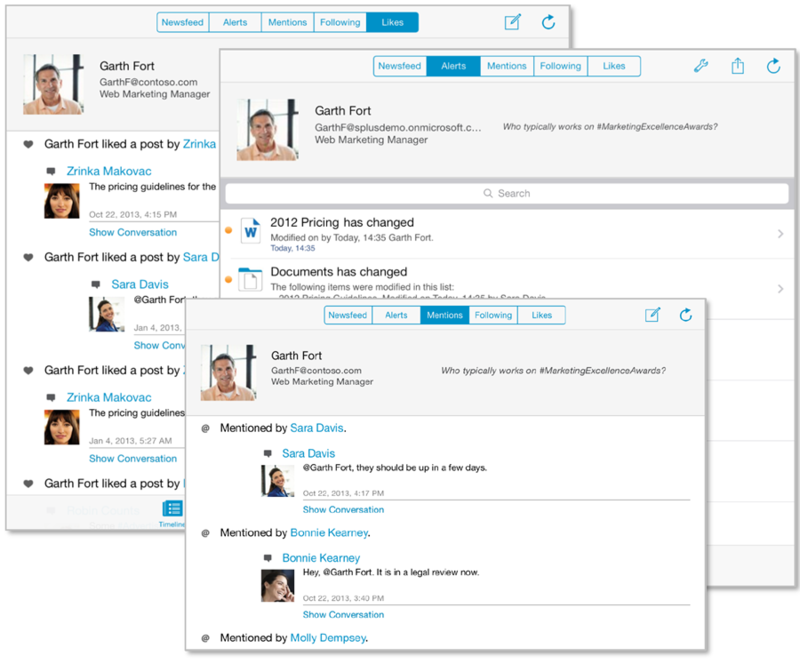 Alerts – Displays all the recent notifications on resources that were modified. SharePlus allows you to keep close track of important resources by marking them with the Alert Me option. Mentions – Gives quick access to all the posts in which you’ve been mentioned. Following – Displays posts from the people and content you are following. Likes – The Likes tab includes all the posts you have “liked”. Timeline sections require SharePoint 2013 to be displayed in SharePlus. Alerts is the only exception and is always available in the Timeline. The People tab displays the list of people that you are following and the ones following you. In this section you can connect with people, access their content and activity feed and also start conversations with them. The Social Module gives you access to the content of your SharePoint’s personal site, including both your public and private document libraries. 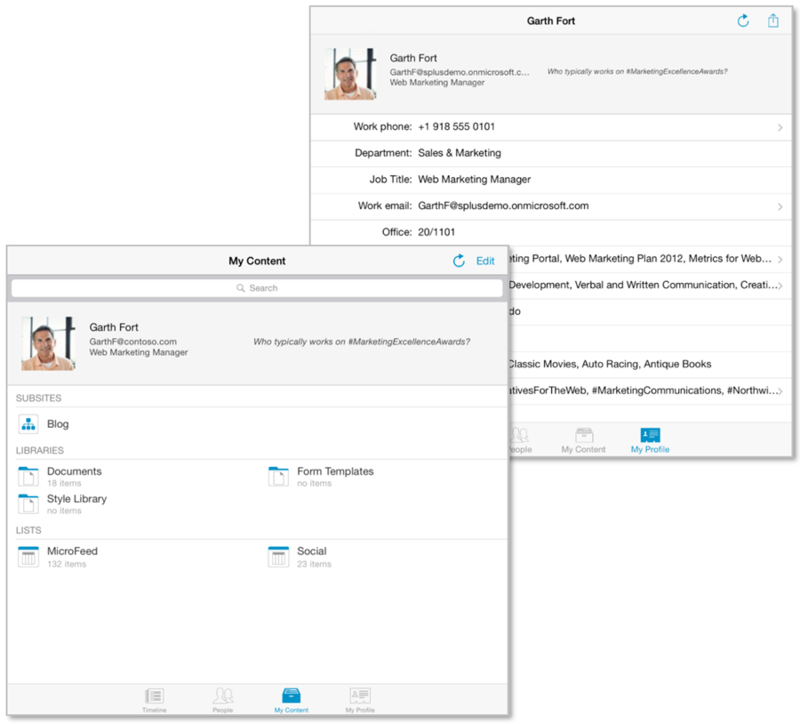 Also, you can visualize or edit your personal information shared on your corporate social network. When working with SharePlus Enterprise and SharePoint 2013 server you can get recommendations on sites and documents that may be relevant to you. The portal suggestions are included on the SharePlus list view under the Recommended section of the Favorites Module. The sites, documents, and people that you follow is also listed in the Content and Social Modules respectively. Through the SharePlus User Interface you can choose to Follow/Unfollow content from a SharePoint 2013 server.